Sattu sherbet is very beneficial in the summer, there was a time when these kinds of cold drinks were not available, then in the houses sattu, jaggery, or only sugar and lemon juice were drunk and in summer the most beneficial mango panna was given to the guests, but nowadays, different kinds of drinks are found in the market, due to which the trend of these traditional drinks has decreased slightly. 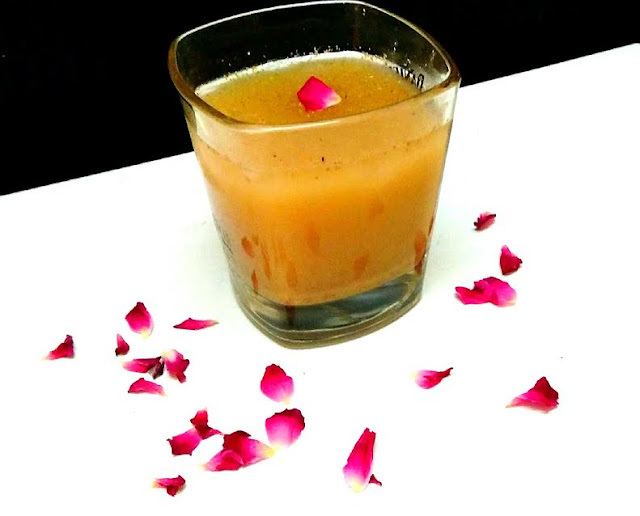 Sattu is a healthy summer drink. which is made from sattu, sugar syrup and flavored with rose water or kevra water. rose water or kevra water is optional. Sattu is prepated by dry roasting grains or grams, mainly barley (with skiin) or bengal gram, the dry powder is prepared in various ways as a principal or secondary ingredient of dishes. Take sattu powder and water in a large bowl or jug, stir and mix well. Now add chilled water, rose water again mix well. Pour the crushed ice in serving glasses, then pour the mixture equally in each glass. Garnish with rose petal serve chilled. mix again before serving. Note :- Do mix well before serving, otherwise the sattu will sit down and the taste will get spoiled.